Dog aggression is often misunderstood by owner and onlookers, alike. On the surface, it is scary and, of course, threatening. 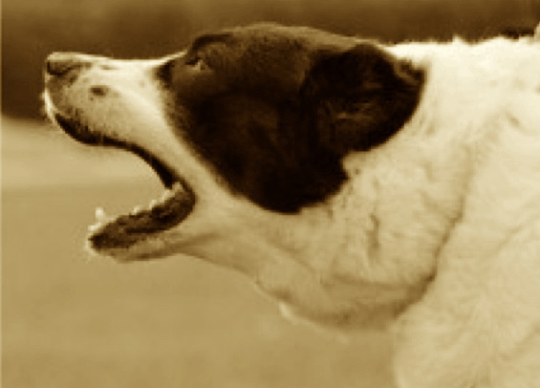 It is important to understand that aggression can be the result of many issues, often not obvious to the owner. It is all too easy to adopt the wrong approach for an aggressive animal. I can give an example from today’s walk with Ziggy (my rescued deerhound cross) in a large, open part of woodland (safely fenced off, making it ideal for some dog training and observation). We came across a lady with a rescued lurcher, quite a large male. At distance he was fairly relaxed, however, as we got closer, the dog (he was called Storm), lunged forward, on his lead, bearing his teeth and barking aggressively. On the surface, an aggressive individual. However, after talking with the owner, it was clear that this dog was exhibiting fearful aggression, in other words he saw each dog as a potential threat and was acting accordingly. We have to remember that dogs default to two clear approaches — flight or fight. This fearful dog could not take flight, he was on a lead and harness, therefore he defaulted to his other option, fight. So, what can be done? The first point to make is that aggression, from whatever source, can be difficult to deal with; it needs an experienced person who understands how a dog functions. I would strongly recommend seeking the help of a canine behaviourist in this case (not a trainer). This dog, after my dog backed off quickly became calm again, although still alert. He was friendly with me, a complete stranger, and was happy for me to give him a treat and to stroke him, gently. I would suggest, that this dog is another example of an animal that, probably, has not been socialised properly in earlier life. He was being taken on group walks (with a trainer) with other dogs. But here’s the rub, these dogs were never being let of the lead — essential, in my opinion, to allow dogs to socialise together in a pack type environment. Therefore, this dog was never of the lead, allowing him the chance to behave as a dog with other dogs. My suggested solution would be to muzzle the dog with a baskerville muzzle, then take the dog for walks with another, relaxed dog — but keeping significant distance between them, gradually decreasing the distance as Storm becomes more relaxed with the situation (systematic desensitisation). After this — both dogs should be let off the lead — any response from Storm should be dealt with calmly. Eventually it will be possible, after meeting other dogs of the lead, to remove the baskerville muzzle. What an owner should not do is comfort a fearful dog when another approaches — this will just make matters worth — you will be reinforcing the behaviour that you wish to eliminate. Finally, I would strongly suggest that professional assistance is sought in any case of aggression. Proper assessment is paramount here, including veterinary examination (many medical conditions can be the source of aggression). Taking the plunge	The angry dog owner!